In response, sourcing processes have to change, traditional RFP processes take too long, cost too much and deliver less than optimal results thanks to lengthy documented processes, arm’s length discussions and a “sales-led” supplier engagement. Our research shows that once the hygiene factors are addressed, it is these hidden factors that determine whether a sourcing relationship thrives in the mid to long term – see our blog The Future of Technology Sourcing for more information. 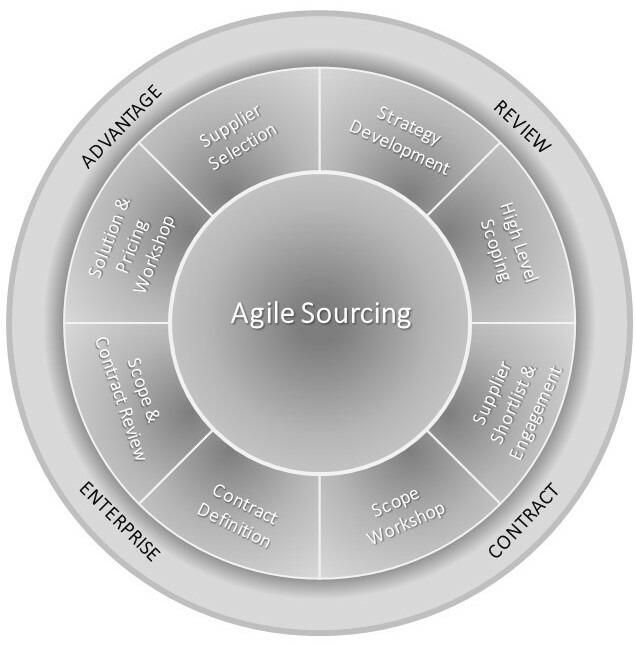 Agile sourcing is a sourcing methodology that addresses the hidden factors whilst significantly speeding up the procurement of outsourced services, building in greater alignment and developing stronger relationships, between customer and suppliers. The overall solution and value proposition is created in collaborative workshop sessions, driven by the supplier, but with high level guidance and key points of the agenda, provided by the customer. Suppliers are challenged to solution and differentiate their service, in these workshops, using their true differentiators and value-adds, and to create a proposition truly aligned with the client desired outcomes for the relationship and their business objectives. Contractual terms and conditions are pro-actively developed during the process, reducing any material “surprises” and significantly shortening the contract drafting and negotiation process. This early build and test of the culture, communication and relationship, focuses on the hidden factors and secures the success of the arrangement through the transition phase and into the ongoing implementation phase, for both parties. This in turn generates more transformation, flexibility, strategic input and support for both the solution and the relationship. We have run many agile sourcing approaches for our clients and seen how numerous suppliers throughout the industry have performed, providing us with great insight of what works well and what to avoid. Maximum value to the customer, enabling the best solution to be created for them and their business. Significantly reduced bid timescales and (for suppliers who are able to engage effectively with the process), a much increased win probability. For more information on how we can support you in successful agile sourcing (whether buy or supply side), please contact us on enquiries@quantumplus.co.uk or 01789 201630.